Remove dings and dents while protecting your vehicle’s original finish. 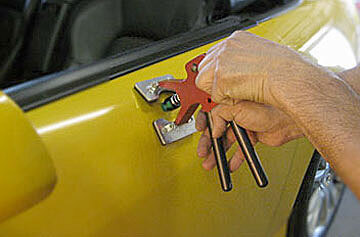 Paintless dent removal is the best choice to remove dings and dents from your vehicle. It saves time and money, and preserves your vehicle’s original paint finish. Paintless dent removal is very effective when your vehicle’s paint has not been cracked or damaged. Our technicians remove dings and dents using special tools, rods and reflective sources. The dent is massaged from the inside of the damaged panel, eventually leading to an undetectable repair. This is all done without the use of body fillers or painting, which has the added benefit of protecting your vehicle’s original finish. If we are unable to remove damage using paintless dent removal, we will credit the price toward a traditional auto body repair involving repainting.